OS grid reference: SE 0912 4943. Just half a mile to the north-east of Addingham at Nesfield, West Yorkshire, is Castleberg Hillfort, said to date from the Iron Age although the site has never been properly excavated by archaeologists and therefore it could be earlier, maybe late Bronze Age, which would then make it an enclosure or settlement, and quite probably the Roman legions came this way on their way to the fort at Ilkley (Olenacum or Olicana?) and maybe ‘made camp’ here on the hill at some point; the name Castleberg is distinctly a Roman one. The hillfort stands at the top of a naturally-formed hill that has a Limestone scar at its southern side. Much of the western side of the site is covered in woodland which stretches down to the river Wharfe, while a little further to the south, opposite Low Mill village, and hidden in trees beside the river lies the famous Castleberg scar, which is actually a Limestone crag. The town of Ilkley is 3 miles to the east on the A65 and Bolton Abbey is 9 miles north-west along Bolton Road and then the A59. The shape of the hillfort is quite odd, really, mainly because it follows the contours and curve of the hill. It measures, roughly, 140 metres in width, 130 metres lengthwise and 130 metres in diameter; the earthworks being more visible at the eastern side and at the western and north-western sides where earthworks run off from the fort itself; the south-side of the hillfort follows the natural curve of the hill above the river Wharfe. A few well-known Victorian antiquarians and historians have visited this site and more or less they all agree with each other with regard to Castleberg, though there is still much uncertainty about its true age – the Stone Age through to the more recent, Roman period? There have been a couple of finds dating from the Bronze-Age, but nothing particularly substantial. 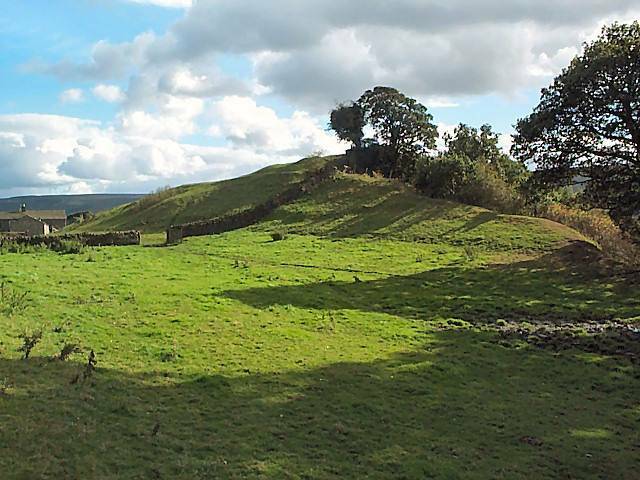 This man-made defensive hillfort would have provided its occupants with a panoramic view of the surrounding area for miles around and would ‘certainly’ have given them prior warning of any signs of hostility advancing up the Wharfe valley. On Addingham Low Moor just east of the village, near Woofa Bank, there are several more ancient sites including: tumuli, enclosures and round dikes, making this a very rich area of prehistory, while to the south-east there is Ilkley Moor with many, many more ancient antiquities. St Peter’s Church at Addingham (SE0851 4969) is said to have been built on a pagan site though the present building is 15th century; it houses a a very nice carved section of an Anglo-Saxon cross, dating from the 10th century. Bell, Richard., Village Walks in West Yorkshire, Countryside Books, Newbury, Berkshire, 1998. Categories: Hillforts | Tags: Castleberg Hillfort at Addingham in West Yorkshire, Iron-Age hillfort at Castleberg in West Yorkshire | Permalink.